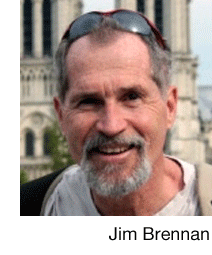 Jim Brennan was a paperboy, carwash grunt, Teamster and welder before his18th birthday. He grew up to become an industry analyst and today writes about health, fitness and travel from his home base in Bucks County, Pennsylvania. Jim is a 12-time marathoner, organic gardener and usually carries a pen and camera. His work has appeared nationally and his short stories have been selected as finalist in international writing competitions.